Trump is now encouraging Senators Alexander and Murray to proceed with Obamacare-stabilization negotiations, which he has done everything possible to thwart. 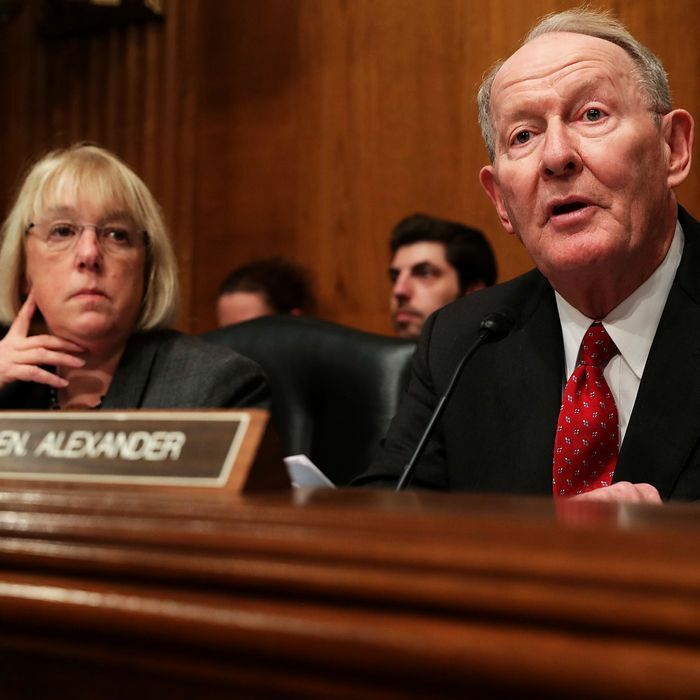 Pity Lamar Alexander and Patty Murray. The Republican chairman of the Senate’s Health, Education, Labor, and Pensions Committee and the committee’s ranking Democrat have been working on legislation to stabilize Obamacare markets for months. Their talks began soon after the collapse of the initial Republican health-care drive in late July; and were called off for a while during the subsequent effort to enact the Graham-Cassidy block-grant legislation. Alexander and Murray’s negotiations were made both more urgent and more politically complicated last week when the president abruptly announced that he was canceling the payment of Cost Sharing Reduction (CSR) reimbursements to insurance companies. It’s now clear that only legislation can bring back the payments that offset insurers’ obligation under the Affordable Care Act to ensure that low-income consumers can buy an individual health-insurance policy without ruinous out-of-pocket expenses. But Trump’s high-profile branding of CSR payments as “bailouts for insurance companies” — which conservatives have echoed for months — has certainly poisoned the well among Republicans for supporting a deal, while creating the prospect that the president would veto such legislation if it somehow did make it to his desk. Alexander said Trump told him by phone Oct. 14 he’d like to see a bill that funds the Obamacare cost-sharing subsidies that he abruptly cut off last week. In return, he wants to see “meaningful flexibility for the states in providing more choices,” Alexander (R-Tenn.) said. “Republicans are meeting with Democrats because of what I did with the CSRs — because I cut off the gravy train,” Trump told reporters. The main problem with this I-broke-it-so-Congress-can-fix-it approach is timing: Trump’s cancellation of CSR payments guaranteed big premium increases for 2018. If Alexander and Murray do cut a deal, and it gets through the Senate (where it could be filibustered by conservatives opposed to both a “bailout” and to anything that helps Obamacare function), and House Republicans put aside their contempt for their Senate colleagues long enough to rubber-stamp it, and Trump doesn’t reverse his position in the meantime — the damage may already be done for 2018, and will become difficult to reverse. Aside from timing issues, congressional Democrats, who know Republicans will get the lion’s share of the blame for a new Obamacare-premium crisis, aren’t likely to approve a deal that undermines Obamacare. If Republican conditions for a deal involve broad authority to let states unravel such Obamacare provisions as guarantees for people with preexisting conditions and requirements that health plans offer certain essential benefits, then Democrats may just walk away. Even without government reimbursements, insurance companies are still going to be required to offer CSR subsidies to low-income consumers, and the federal government is still going to be required to offset higher premiums with tax credits for those who qualify. In the end, higher-income people in the individual market — including a lot of Republicans — are going to be the ones most affected by Trump’s efforts to sabotage Obamacare. And Republicans will have no one but themselves to blame.